For trainer-teacher-learners with backgrounds in journalism—and I suspect there are plenty of us—attending the Association for Education in Journalism and Mass Communications (AEJMC) 98th Annual Conference (held here in San Francisco this year) is a bit of a homecoming. It’s not just the joy of being around more than 2,000 thoughtful, innovative colleagues from all over the world as we explore trends, challenges, and developments in journalism and mass communication; it’s an opportunity to see how our training-teaching-learning colleagues in a vitally important part of our contemporary world are continuing to hone their own skills while fostering the next generation(s) of professionals who will shape the face of the industry and the world it serves. As is the case with any ambitiously-designed conference, the number of sessions to explore is overwhelming and hints at the importance of incorporating at least a couple of digital-literacy skills into the experience of treating conferences as part of our lifelong-learning experiences: the skill of sifting through torrents of information (in this case, to initially identify what is most likely to contribute to our own lifelong-learning needs), and an ability to use digital resources to enhance our learning. These skills, I might add, are clearly essential not just to the journalism and mass communications colleagues whose company I’m currently enjoying, but to any of us involved in the constantly-evolving world of training-teaching-learning. The sifting, in this case, takes place at a variety of levels. Access to the online schedule before arriving onsite at the conference gave us an opportunity to make preliminary decisions regarding which sessions would most likely meet our learning needs. Receiving the printed copy of the 270-page conference book onsite allows us to fine-tune those choices a bit more. Following the Twitter feed from the conference draws our attention to colleagues’ recommendations for opportunities we might otherwise have missed. And hallway conversations add the icing to the conference cake by giving us opportunities to meet presenters whose sessions might otherwise not have made it onto our must-attend lists. Using digital resources to enhance our learning not only while we’re here but long after the conference formally concludes is something equally worth noting and exploring. The simple act of tweeting highlights from sessions we attend pays off at several levels: we produce a set of online notes to which we later can return to continue our learning; we see onsite colleagues’ tweets from those sessions and others we are not physically able to join, thereby increasing the breadth and scope of our conference/learning experience; we occasionally engage online with colleagues who couldn’t be here physically but feel less “left behind” because of our online exchanges; and the natural inclination to occasionally, while a session is underway, go online to find a site that further explains what is being discussed means we are extending the reach of these physical learning spaces well into the virtual world to create an onsite-online classroom that is limited only by our imaginations and access to the Internet. This plays out nicely, as I saw during a “State of the Industry” panel discussion—the first session I was able to attend at the conference—yesterday afternoon. At the heart of the learning experience was a first-rate set of panelists: panel moderator Bob Papper, Director, RTDNA (Radio Television Digital News Association) /Hofstra University Annual [Industry] Survey; Teri Hayt, Executive Director, American Society of News Editors (ASNE); David Smydra, Executive Producer, Google Play Newstand; and Robert Hernandez, Associate Professor of Professional Practice at USC Annenberg. Adding to the experience was our ability, while tweeting highlights of the session, to see tweets from colleagues in other sessions where subject matter occasionally complemented what we were absorbing—which provided an opportunity, at a limited level, to actually create a much larger virtual learning space than any of us might have anticipated. Another element—common to what I experience while attending conferences these days—was the opportunity to extend that virtual classroom to include online resources that could provide additional background to unfamiliar topics the panelists were presenting. It was at that moment that I realized I was experiencing a key learning moment described by so many of our best training-teaching-learning colleagues: that moment of learning that builds upon what we previously learned. As a blogger (as opposed to the broader role of writing articles and co-writing a book), I’ve come to appreciate the obvious and unique art form online writing offers: the ability to develop a cohesive piece of work that, through hyperlinks, allows readers to read start-to-finish or take as many detours as they care to take—and if I also make the piece more visually stimulating by embedding photographs or images of videos that include live links, I’ve further taken advantage of what this particular art form offers me and those who read my work. Smydra’s comments inspired an instantaneous building-upon-previous-learning leap from what I have been seeing in blogging to what I was beginning to see in Structured Journalism: a form that includes writing, imagery, video work, and more combined as unique, innovative, creative mash-ups providing another cohesive form of work/writing/journalism—with the added benefit of producing additional unique elements/source material that could be repurposed elsewhere. As I continue thinking about what Smydra and his colleagues provided through their presentations, I continue taking advantage of the numerous streams of information and other resources that make conferences so richly rewarding as part of our lifelong learning landscape. There are the tweets. The conversations over a meal during an opening-night reception last night. The Storify recap of conference highlights from sessions yesterday. The bookmarked websites I accessed to write this piece as well as the websites to which I haven’t yet had time to return. My own stream of conference-related tweets (August 6 – 9, 2015) through my @trainersleaders Twitter account. And links to PowerPoint slide decks and other resources allowing us to draw upon our digital-literacy skills to continue the learning that is proving so rewarding in this and expanded moments of learning. All of which makes me suspect that Structured Journalism is already claiming a place in my training-teaching-learning-writing world. N.B. – This report from the AEJMC 2015 Annual Conference is also the fifth in a series of reflections inspired by our ALA Editions “Rethinking Digital Literacy” course. The course is literally and somewhat chaotically all over the virtual map. It has an obvious, easily-accessible home base, which is our learning-management-system (Moodle). During Week 2, Rethinking has fostered increasing levels of digital literacy by moving out, beyond our virtual classroom walls, and expanding into Twitter; Facebook; blogs; and, as of this morning, a learner-produced video posted within and shared from Google Drive. And there’s no end in sight as to how far it can and will extend, which is fine: this connected learning, rhizomatically-growing learning experience is at least partially helping well-supported learners within a vibrant community of learning to viscerally understand that a key digital-literacy skill is an ability to navigate a variety of online resources and venues without allowing ourselves to become overwhelmed. Our methodology, so far, appears to perfectly match and support the content, learning goals, and user experience within Rethinking. In designing and facilitating the course, I’m attempting to create an engaging, stimulating, learner-centric, results-based experience where learners (or to borrow one of my favorite terms that continues to evolve from the Educational Technology & Media MOOC—#etmooc: “co-conspirators”) are partners in the digital-literacy learning process. Where the original conspirators (those designing and facilitating the course) in #etmooc inspired a group of co-conspirators in the form of #etmooc learners who collaborated on designing and facilitating a follow-up massive open online course (MOOC), the co-conspirators in Relearning include every learner who is joining me in shaping and learning from the course. Another match between methodology and content/learning goals/experience within Rethinking is the focus on co-conspirators learning how to define and foster digital literacy by identifying and further developing the digital literacy skills they bring to the course. They are offered—and some are taking advantage of—opportunities to learn about digital literacy by exploring digital tools and resources of interest to them and to those they serve. The process is still very much in its early stages, but is already producing results similar to what I saw—and was inspired by—in #etmooc. A few Rethinking learners are using blogs to document and build upon what they are learning. Others, as a result of asynchronous online group discussions within Moodle, have agreed upon a Twitter hashtag (#ReDigLit) they can use to carry their discussions and learning into the Twittersphere. The latest expansion of our semi-controlled chaotic approach came this morning through the creative approach course participant/co-conspirator Joan Jordan took in playfully completing a warm-up exercise I offered for Week 2: she combined the assignment with an ongoing optional avenue I’ve encouraged learners to explore (try a new digital literacy tool of their own choosing each week to expand their digital-literacy toolkit). Joan decided to learn how to use the video capabilities of her smartphone, learn how to upload the video she created, and learn how to share a link to that video from an online venue (in this case, Google Drive). With that as the foundation for her approach, she responded to the actual warm-up assignment: watch a brief, charming video showing young learners displaying a variety of digital literacy skills, identify as many digital literacy skills in use as possible, and post the resulting list of skills within our Week 2 online discussion board. The result was extremely engaging: she filmed her cat, produced a video that had the cat telling us which digital literacy skills were observable in the video Joan and other course participants are viewing, and shared that video with us in place of providing a text-based inventory of the skills on display. In the best of digital-literacy approaches, she not only managed to learn what she wanted and needed to learn, but also inspired a lively conversation that is continuing to develop back at home base (Moodle). An additional intriguing element of our collaboratively-developing methodology—very much what I would call “the #etmooc method” because that’s where I first experienced it—is the opportunity to see whether what grew out of #etmooc could develop from an online course that is not a MOOC: a sustainable community of learning that continues long after formal coursework concludes—what I have only half-jokingly referred to as a MOOChort elsewhere. As my Rethinking co-conspirators continue to define and explore digital literacy by carrying their conversations into a variety of digital settings, I suspect the seeds of a post-Rethinking community are already beginning to germinate. N.B. : This is the second in a series of reflections inspired by our ALA Editions “Rethinking Digital Literacy” course. With the roll-out of a new four-week ALA Editions online “Rethinking Digital Literacy” course a few days ago, I’m once again happily immersed in an ever-expanding, extremely intriguing moment of training-teaching-learning-exploring with a fantastic group of colleagues. At the heart of the course is a newly-forming community of learning (comprised of 45 library staff members and administrators from the United States and several other countries) creatively tackling the challenge of attempting to define digital literacy in ways that help community members more effectively design, develop, and deliver learning opportunities to foster greater digital literacy among those they serve. And there’s the rub: it turns out that even defining the term, as we’re seeing from Doug Belshaw’s Ed.D thesis (What is ‘digital literacy’? ), is one of those enticingly wicked problems—something that is “difficult or impossible to solve because of incomplete, contradictory, and changing requirements”—that can keep us up late into the night…for many nights. 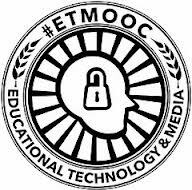 I have gladly and very rewardingly spent quite a bit of time exploring digital literacy as a result of participating in discussions that began among those of us enrolled in the Educational Technology & Media MOOC—#etmooc—in early 2013. Some of those explorations led me to what I believe to be an essential digital literacy skill: an ability to work within much different time frames than we normally envision—time frames in which a “moment” (particularly in online learning, as described by Pekka Ihanainen and John Moravec in 2011) extends forward over periods of weeks, months, and even years while also extending backward as we come across, and respond to, threads of conversations we hadn’t previously seen. Think of all these exchanges as one magnificent synchronously asynchronous moment, and you begin to see what some of us are already viscerally experiencing. Let’s be explicit here before we drown in jargon and fanciful proposals. Exploring digital literacy within the flexible structure of #etmooc started as a shared two-week journey with colleagues worldwide. By interacting with each other synchronously as well as asynchronously, supported by first-rate learning facilitators—including Alec Couros and Belshaw himself—we learned plenty. At the end of those two weeks, we walked away with more questions than answers, as is often the case when we are drawn into the exhilarating challenge of attempting to address a wicked problem. The result is that some of us continued to explore the theme; found and responded to tweets, blog posts, and online articles; and became part of an ongoing conversation with no easy-to-define beginning or ending point. Even more rewarding for those of us who continue to explore ways to better serve our learners was the realization that the #etmooc connectivist approach provided plenty of inspiration as to how we can interact with and engage learners—an invaluable tool in a world where adult learning—particularly workplace learning—is often mistakenly viewed as something that detracts from “real work” rather than being seen as an integral element of successful work. Building upon what I had already been doing to engage online learners (e.g., facilitating online office hours through Facebook, tweet chats, Google Hangouts, and other social media platforms), my colleagues and I continually look for ways to foster the creation and growth of communities of learning that support results-driven learning—we’re looking for positive, results-driven, meaningful change among learners here, not just blasting through a one-time session that produces nothing more than a learning badge or certificate of completion that fades almost as quickly as memories of the learning session do. Perhaps one of the key lessons learned in that connectivist massive open online course (MOOC) was that rewarding, connected, significant learning is going to expand beyond the time constraints we initially expect to face when diving into a course with specific start and end dates—the #etmooc community, for example, continues to thrive long after the course formally ended. We need to keep that in mind; plan for it; and, when appropriate, support it so that our—and our learners’—learning goals are met. 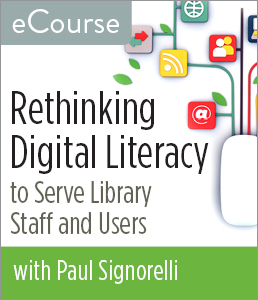 This more or less brings us full circle to the current Rethinking Digital Literacy course. Inspired by those #etmooc discussions and creatively flexible pedagogical approaches, I developed a course that begins within a formal learning management system (Moodle); offers opportunities for the learners to carry the discussions and the learning beyond the boundaries of that course (e.g., into blog postings, tweets, shared videos); and encourages the learners to explore and use any digital tools they want to use in their exploration of digital literacy. Much to my delight, the discussions among the learners are already well underway just days after the course formally opened to them. The spirit of exploring digital literacy via their digital literacy tools is stunningly and encouragingly on display within the course discussion boards. One learner, quickly understanding that the challenge of defining digital literacy is going to be an iterative process, posted an initial definition that was followed by two refinements within the first few days all of us began working together. A few others are already reaching out to each other to establish a formal hashtag that they can use to extend their conversations into Twitter—one way of retaining access to their discussions long after their access to the learning management system ends. Another, with a strong background in IT, is already extending our definitions by suggesting that one aspect of digital literacy involves “an ability to translate the functionality of one [digital] application or format to another”—in essence suggesting that digital literacy implies an ability to help others learn how to use digital tools and resources. What is striking about all of this is the breadth of experience, the depth of thought, and the levels of engagement these adult learners are already bringing to the course in its earliest stages—and how many apparently disparate learning moments are combining into a shared/collaborative moment that is continuing to grow as I write these words. Ultimately, I suspect that our collaborations will lead us to acknowledge this defining moment as one in which, by attempting to define digital literacy/literacies and expand our view of the synchronous and asynchronous moments we share in our online training-teaching-learning endeavors, we gain a deeper understanding of what digital literacy might be, how it works, and what it means to us and to those we serve in a rapidly evolving learning and work environment. N.B. : This is the first in a series of reflections inspired by our ALA Editions “Rethinking Digital Literacy” course.